On a December day in Seattle’s Rainier Valley, Sharon Maeda, ’68, directs two men moving a table from one end of the room to another. They take a stutter step toward the door and then to the right, maneuvering between the boxes and furniture before setting the table down with a thud. Maeda and her team have a big job: They are creating a radio station from the ground up. Maeda has come out of retirement to become the first station manager of Rainier Valley Radio/KVRU 105.7 FM. In 2013, the FCC opened up low-power FM licenses, authorized to broadcast to an area with a radius of roughly 3.5 miles. After Florida, Washington state has the second-highest concentration of these hyperlocal stations among the country’s 15 most populous states. They give communities outside the mainstream a voice and access to information, something Maeda sees as a critical need in the wake of the 2016 election. When she speaks, her warmth is matched by a no-nonsense demeanor that shows itself when she bluntly tells you how it really was — no candy coating or rose-colored glasses. She knows all too well how communities can become scapegoats in a time of high anxiety. Maeda’s parents were among the 9,000 Japanese Americans interned in Minidoka concentration camp in Idaho during World War II. Her uncle was Minoru Yasui, a Portland lawyer who tested the constitutionality of laws targeting Japanese Americans when he was arrested for breaking curfew. Along with that of UW alumnus Gordon Hirabayashi, his case was one of three on this subject to make it all the way to the U.S. Supreme Court. Maeda has made a career of creating change from the inside out, beginning with her time at the UW. In the spring of 1964, when Maeda was a student, Alabama Governor George Wallace came to speak at Meany Hall. Incensed that this champion of segregation was invited to campus, she discovered that any student group could apply for money from a speakers bureau. She organized her dorm, which housed many of the students of color, and used these funds to bring civil rights leader James Meredith to the UW. Despite this first experience with activism, Maeda still considered herself a “goody two-shoes.” That began to change in 1968. An organizer for the Bobby Kennedy for President campaign, she was devastated by his murder that June. This June 1 and 2, nearly 50 years to the day after Kennedy’s assassination, the Class of 1968 will look back on that time with their 50-year reunion. Maeda is a member of the reunion’s organizing committee. While questioning the status quo more than ever, Maeda became more focused on using her understanding of systems to advance the causes she believed in. In 1970, she was hired as the UW’s first-ever student activities advisor of color. Armed with the knowledge of how the UW works, she urged students of color to run for student body office and gain power through control of student body funds. As the second director of the Ethnic Cultural Center in 1973, she learned that staff at corporate giving offices could write checks up to a certain amount without oversight. She visited corporate offices around town, returning with a check for that amount from all of them. In 1975, when Maeda left to work at KCTS/9, her time at the UW was ending but her career as a community activist was just getting started. She served as a board member of the Seattle chapter of the Japanese American Citizens League and was a founding member of Seattle Third World Women. Maeda first retired in 2015 after a 40-year career as a communications pioneer and community leader. In the 1980s, she was Executive Director of Pacifica Radio, a progressive alternative to the Reagan era. Maeda went on to serve as Deputy Assistant Secretary of Public Affairs for the U.S. Department of Housing and Urban Development and president of Spectra Communications, Inc., among other positions in media and civic engagement. 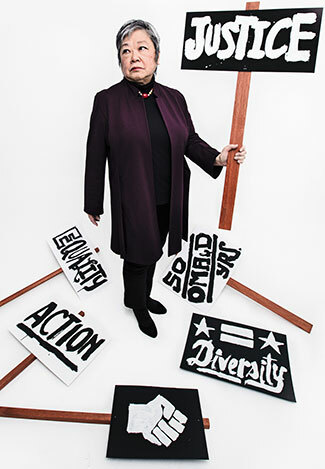 With decades of experience straddling the line between activist and executive, Maeda is now using that savvy to navigate the complex regulations that come along with running a radio station — while serving the diverse Rainier Valley community, whose needs aren’t one size fits all. For example, the FCC requires that station management know what is being said in every language before broadcast. Translation services are critical but also expensive. Maeda applied for and won a grant from the Seattle Foundation to develop bilingual public service announcements. Their pilot program will include announcements in Vietnamese, Chinese, Somali, Spanish and an East African language, only a fraction of the languages spoken in the area. Then the station must work with community leaders to figure out which announcements are needed for which audiences. Every step along the way, collaboration and authentic engagement, a skill Maeda first developed when she walked on to the UW campus over 50 years ago, is critical to getting it right. I grew up in the environment where if somebody is misusing the law against us, we should use the law. I believed in working inside the system to make things that are bad better.